Finished Reading SuperFreakonomics by Steven Levitt and Stephen Dubner. 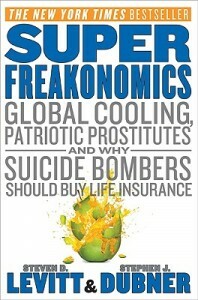 SuperFreakonomics picks up where Freakonomics left off. In this book Levitt and Dubner examine bolder, funnier, and even more surprising topics than in the first book. Like Freakonomics, SuperFreakonomics challenges everyday beliefs by exploring the hidden side of everything. In the book the authors ask questions like: How is a street prostitute like a department-store Santa? What do hurricanes, heart attacks, and highway deaths have in common? Can eating kangaroo save the planet? The two authors, Levitt and Dubner, mix intelligent thought and great storytelling like no one else could to create an extremely compelling book. If you enjoyed Freakonomics you will enjoy SuperFreakonomics. If you haven’t read Freakonomics, no worries you can start with either book. The books cover completely different topics.